The Providence Friars dropped a close one at home against #4 Villanova after clawing their way back from a 13-point first half deficit to get within 2-points in the final minutes, but ultimately coming up short at The Dunk. 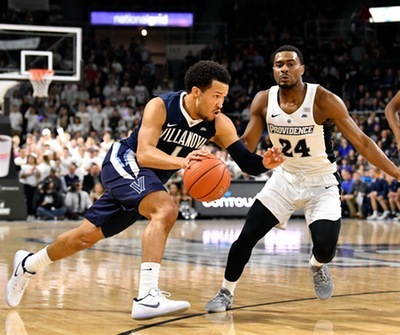 Jalen Brunson and Josh Hart led a balanced scoring attack for the Wildcats and were able to execute down the stretch like a National title contender should to take this one out of the grasp of the Friars. On the PC side, Alpha Diallo showed up…the rest of the squad, not so much. There were some runs here and there for the rest of the team that were put together but they just didn’t put together a good enough 40 minutes to pull out the victory in the end. So Villanova loses Ryan Arcidiacono and now Jalen Brunson is basically a better all-around version of Arch….great. Jay Wright has a knack for recruiting and developing guys who are great 4-year collegiate players. They’re either not big enough, quick enough, or something else to make a significant impact in the NBA, so they never leave early, and just become a thorn in your side as a Big East fan for what seems like forever. Diallo tied a career-high of 18 points on 5-9 shooting. He was 2-5 from three, and chipped in 3 rebounds, 2 assists, and 1 steal. The best part of Alpha playing so well might have been Diallo’s ability to get to the line, going 6-8 from the charity stripe. Rodney Bullock was not good on the night. Scoring just 6 points on a paltry 3-11 from the field, it felt like Rodney was never comfortable or in the flow of the game. Usually, when Bullock is struggling on the offensive end, you can still count on him for his rebounding, but he only took down 3 in this game. His turnover at the end of the game was gut wrenching. It was great to hear John Dolan on the mic announcing the game at The Dunk, even if it was through my television. It brought me back to the good ole college days…can I get a “Go! Friars! Go! Friars! Alpha Diallo was the only Friar to score in double-figures. The normal scoring output came up a little shorter than usual in this one: Cartwright (8 pts), Lindsey (6 pts), and Holt (7 pts) were a combined 9-25 from the floor. Cartwright’s stat line was balanced with the 8 points, 6 rebounds, and 5 assists but he was a little careless with the ball at times, accounting for 4 turnovers as well. The Freshmen all played pretty well in the game. Kalif Young was 3-4 from the floor for 6 points in 14 minutes. Maliek White had a team-high (and career-high) 4 steals on the game. The two of them connected for this nice play in the 2nd half that should’ve probably been and And-1 as well. Although Emmitt Holt didn’t have a big scoring night, he was effective on the glass to the tune of a team-high 7 rebounds. Holt was 3-6 from the floor, but with everyone else struggling to shoot, I really wish he would have attacked the rim more. Plays like this aggressive offensive tip in are what I like to see from him. The refs seemed to have absolutely no idea what a travel was all game. Darryl Reynolds played 20 minutes, had 9 rebounds, but didn’t record a single field goal attempt in the game. Against a smaller Providence team, that seems almost impossible. I just know I’m going to hate Donte DiVencenzo so much these next 4 years, I just know it.